Marchen Veil is an action adventure game the combines the interactive portions of the game with a kind of interactive story known as a visual novel. Rather than interspersing the story with quick updates throughout the game, all of the game's plot is told during very long narratives that are coupled with illustrations which may feature small bits of animation. After the player has read a great deal of text, the next action sequence takes place. The player's time is roughly divided 50-50 between reading and playing. The story of Marchen Veil concerns a young prince who suddenly wakes up in an unfamiliar place to find that he has been turned into a Satyr, a man with the lower body of a goat. Versions of the game were released for computer platforms such as the MSX, the PC-88, the PC-98, the X1, the FM-7, as well as a Famicom Disk System port some time later. 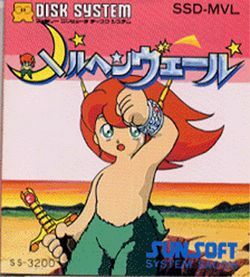 The PC-9801 version is the only one known to be "complete", as it came in two parts; all other versions are based on part 1 only. This page was last edited on 17 November 2013, at 22:24.